I must admit, I went off of Topshop for a while...their prices can be quite high and I hate owning the same clothes as everyone else. BUT, recently I just can't seem to stay away, they have far too many beautiful items to offer and I've been browsing their online store regularly, teasing myself with clothes I can't afford, (gosh I hate being a student). 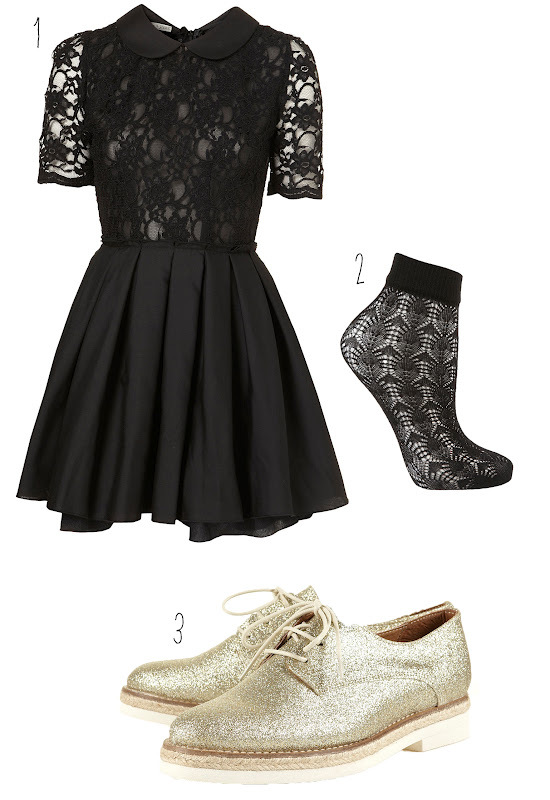 Here's an outfit from Topshop I wish I owned, but don't, sigh. The shape of this dress is divine, the sleeves will cover upper arms, (I don't know if any one else has an upper arm complex but I seem to! ), and the box pleats in the skirt give it body and structure. The lace detail is glamorous with a hint of Gothic yet sophistication and well, who can resist a peter pan collar!? I would pair this beauty with these stunning glitter brogue style shoes and a pair of simple black ankle socks to keep the black theme running through the outfit. By the way I have a sponsored giveaway coming soon, I've chosen something nice and summery for you to win, exciting! I love the dress, anything with lace! My friend recently brought these shoes, she says they are the best buy she has made so far! Too bad for me I'm not a size 6... They're even more gorgeous in really life, too! This looks like it would be such a fantastic outfit to wear! I started a new blog. Its called "Same Same But Different". I would like to share with you my view on fashion, art and other amazing things. I hope you will enjoy the posts of my outfits, fashion and things which are a part of my life. I am happy about every comment or message. And please dont hasitate to criticize or to leave a helpful suggestion. (and i know i really need to learn how to use my camera) Feel free to follow but ONLY if u like it. I'm just discovering your blog! I love it!